If you’re like me, you’ve set some mighty big marketing goals for 2013. Ideas for projects are swirling in your mind, yet each day, you can barely make any headway. Your inner critic keeps chattering away, and you worry that you’ll never find the inspiration or dedication to really make things happen. According to Chris Brogan, New York Times best-selling co-author of The Impact Equation and Trust Agents: “You are the superhero you’ve been waiting for all this time.” You rescue you. And it’s not about your costume, it’s about donning your CAPE (an acronym for his bravery system), taking a combination of small and large risks, and building bridges to get to where you want to be. In It’s Not About the Tights, Brogan’s new personal development guide, he communicates a powerful message of bravery. I’m convinced you can read it in a couple of hours. But then, you will undoubtedly want to go back again and again, filling in your Journal of Bravery (or Bravery Notebook, or whatever you want to call it) while working to improve your confidence and build personal strengths to tackle life’s challenges. The book is based on Brogan’s eight-week course and online community, Brave New Year, which has become an important part of my life as I tackle new challenges and goals. Embracing bravery is key to my success plan in 2013. The brilliance of Chris Brogan’s book and program is that he gently reminds you to be courageous in everything you do while recognizing the human factor — why bravery can be difficult. He acknowledges he continues to learn alongside you, all with a twist of humor and personable charm that lends the impression of a one-to-one conversation. 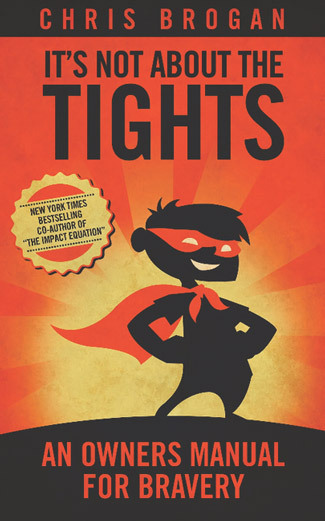 It’s Not About the Tights includes a wealth of practical tools and ideas to build confidence, demolish your inner critic, and grant permission to actually get things done. From apps and systems to games, points and rewards, this little book encompasses big concepts to help you move yourself forward. Will building courage give you the strength to tackle the many challenges in both your business but and personal life? For me, so far so good, which is why I wanted to share this with you. And others in the Brave community are experiencing huge benefits as well. Have you read this big little book? In the comments, please let me know how the CAPE looks on you. You can buy It’s Not About the Tights on Amazon for $4.95 (not affiliate) and learn more about Brave New Year here.